The present boroughs of London were consti­tuted in 1965. Since then there have been many minor boundary changes, of which the most signi­ficant were the transfer of Farleigh back to Surrey in 1969 and Barnet’s later loss of the hamlet of Kitt’s End to the Hertfordshire borough of Hertsmere. Kensington and Chelsea, Kingston upon Thames and Greenwich are royal boroughs, the latter since 2012, when it was honoured to mark the diamond jubilee of Elizabeth II in recog­nition of its many centuries of close associ­ation with the Crown. The ‘royal’ appel­lation is purely honorary, and makes no difference to the borough’s admin­is­trative status or governance. Westminster is a city in its own right, as of course is the City of London. The former is also a conven­tional borough and all its councillors are elected in the usual democratic way. The City of London is a special case – a ‘unique authority’, as it calls itself. Croydon has applied for city status on four occasions, most recently in 2012, when it was yet again unsuc­cessful, as was Tower Hamlets. On the map above, the boroughs of Inner London are tinted darker than those of Outer London. When the Greater London Council was estab­lished in 1965, twelve boroughs and the City of London were desig­nated as consti­tuting Inner London. 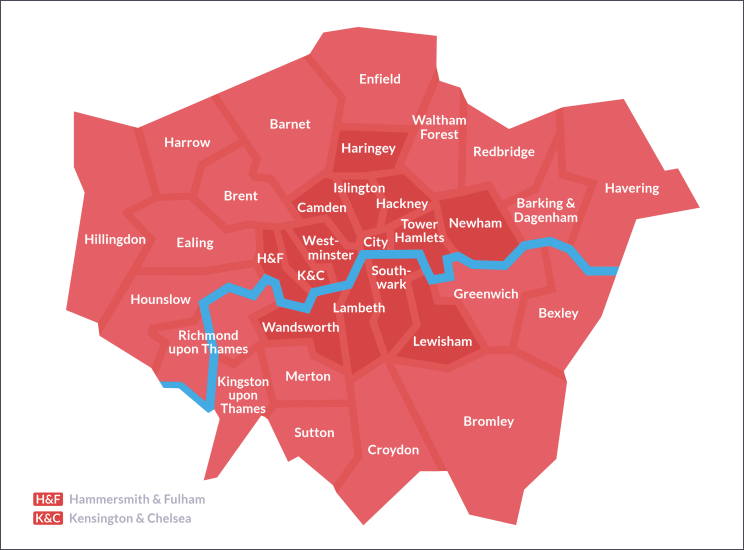 After the demise of the GLC, compilers of official statistics intro­duced a revised defin­ition that excluded Greenwich and included Haringey and Newham (as tinted on the map). However, the London councils have stuck with the old categor­isation – as does the GLA’s London Plan, except that it has moved Newham from Outer to Inner London. The Department for Education employs a defin­ition all of its own when calcu­lating ‘weighting allow­ances’ for teachers’ salaries. The DfE’s idea of Inner London includes every borough that doesn’t touch the outer edge of London – thus incor­por­ating Barking & Dagenham, Brent, Ealing and Merton. None of these defin­i­tions is ideal. 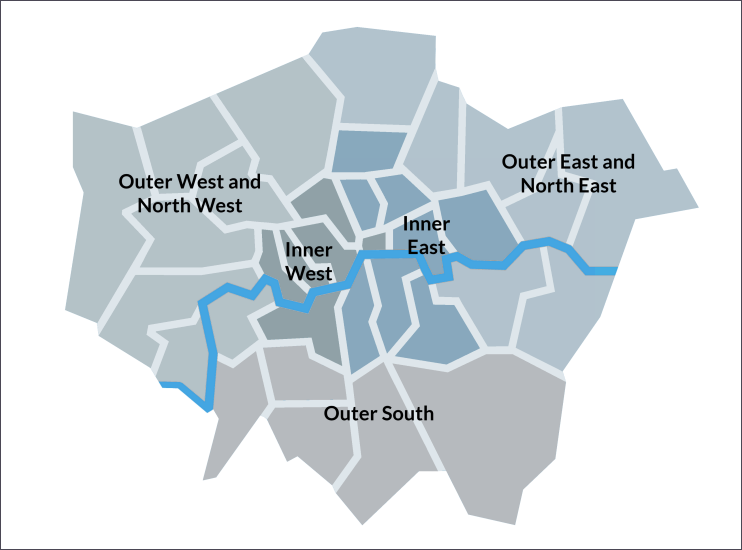 The most authentic way to divide Inner London from Outer London would involve drawing the boundary line through several boroughs, but this would obviously bring its own diffi­culties. Level 2 of the UK’s Nomenclature of Territorial Units for Statistics divides London into five parts, as shown below. To see precise borough bound­aries in an online street atlas, Hidden London recom­mends Streetmap​.co​.uk. The bound­aries are shown as thick purple lines in the 1:2500 and 1:5000 views. Streetmap is also good for postal district bound­aries, which are shown as thin red lines at the same levels of zoom. 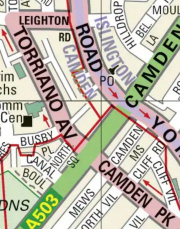 For example, the detail featured here shows the boundary between the boroughs of Camden and Islington (running along the middle of Brecknock Road and York Way), as well as the meeting point of the NW1, NW5 and N7 postal districts. There’s an inter­active tool on the NatWest website for comparing inform­ation on average property prices, crime rates, school ratings, etc. across all the boroughs of London.